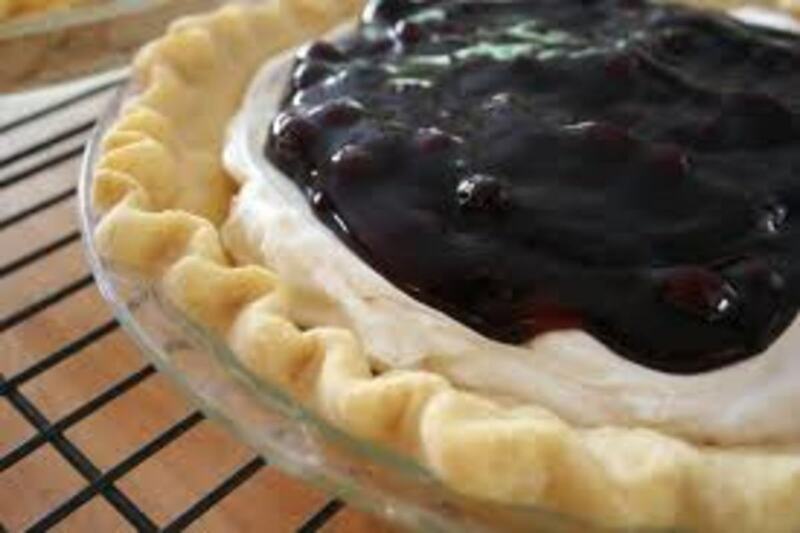 In the summertime, I am truly always trying to perfect my dessert recipes and have a few that are staple for me. I am not sure, but for some reason I have always been a huge sweet eater and so are my husband and kids. 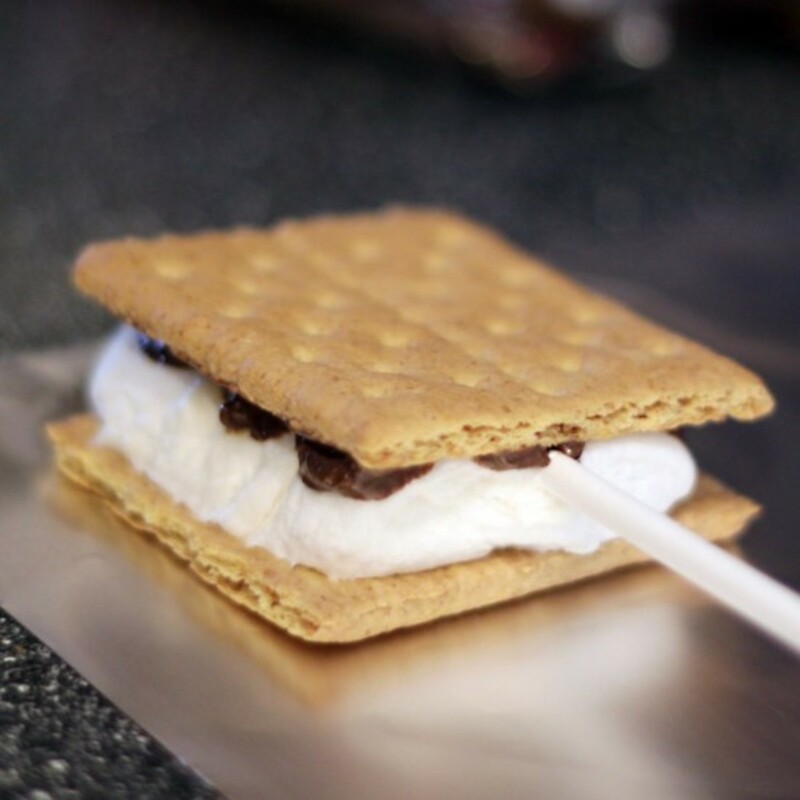 Growing up, smores were always a summertime staple with our family and when I first met my husband it was summertime and of course we started to discuss our childhood and days of past. 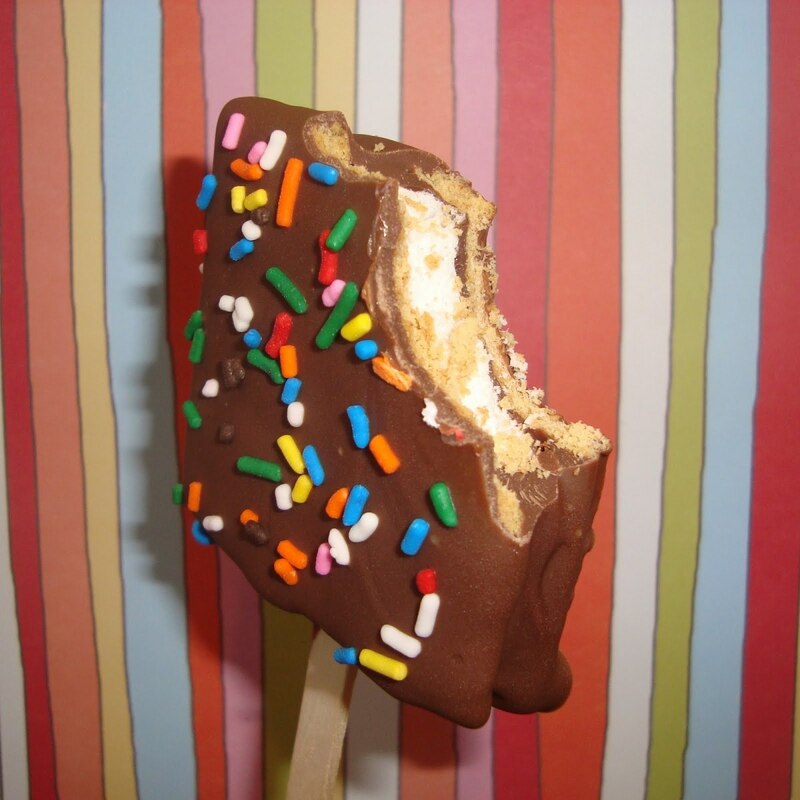 One of the first foods we recalled eating was ice cream from Mr. Softie, but then we started to talk about desserts our moms made and smores was a winner for both. So we of course tried to make them and then for some reason we looked up recipes for them online and I found a recipe with a twist, which was to cover the outside of the smores with chocolate too!! Well, how could I pass that up seeing how much we both loved chocolate. We went to buy the ingredients and sprinkles also just happened to jump into our cart too. We got home and made these smores and lo and behold chocolate on the outside as well as the inside is absolutely to die for and completely ingenious. Well, every summer now without fail (we have been together for 9 years and married for 6 Years), we have made these smores. Hope you try them and enjoy them as much as we do. Yields: As many as you desire in one sitting!! 1 package Chocolate Chips, I use either chocolate or vanilla chips, depends on what we feel like. 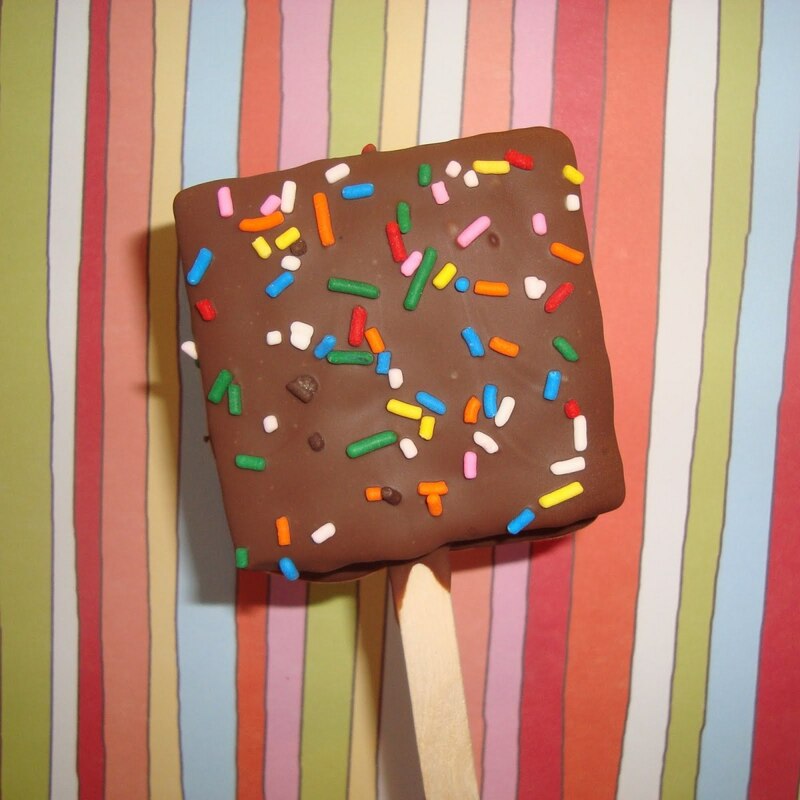 1 Container Rainbow Sprinkles, Can substitute chocolate sprinkles or even use both! Stack 1/2 of a graham cracker with a chocolate bar and marshmallow and top with remaining graham cracker. Place 3 on a plate at a time in the microwave for about 10 seconds or just long enough to slightly soften chocolate and marshmallow. 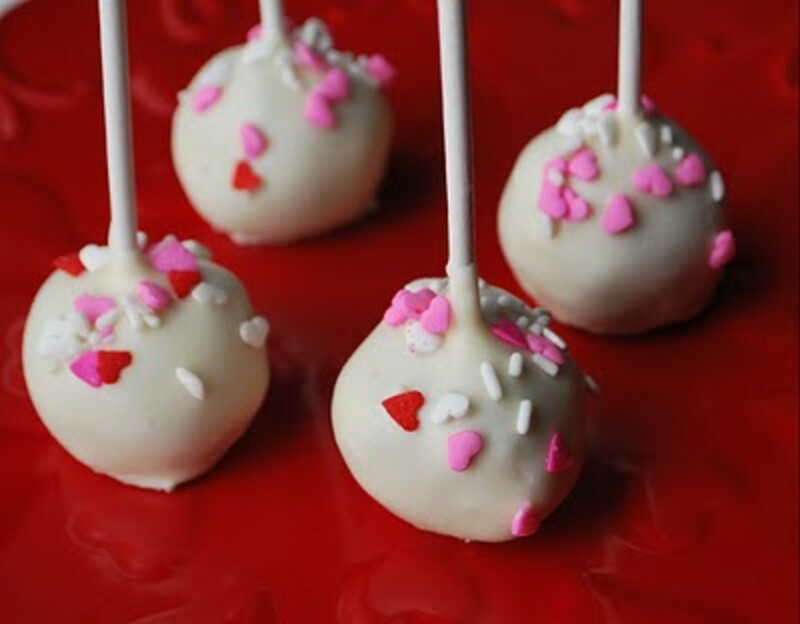 Quickly, while still warm, insert skewer stick into marshmallow. Place smores on wax paper sheet and put in freezer for about 30 minutes. This will make every thing nice and firm for dipping. Melt your chocolate chips (we sometimes use vanilla chocolate chips to mix it up, because my kids like both). 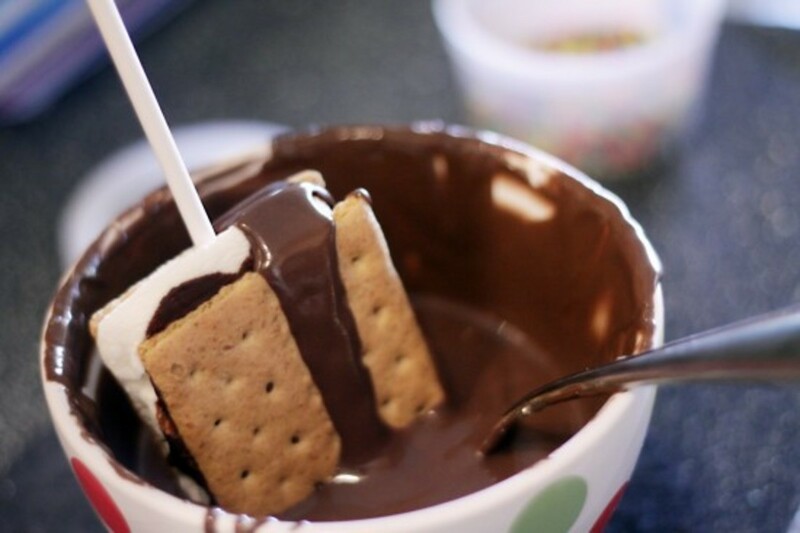 Dip each of your s’mores and shower with sprinkles while still wet. Place them back on waxed paper to dry or set for a few minutes. 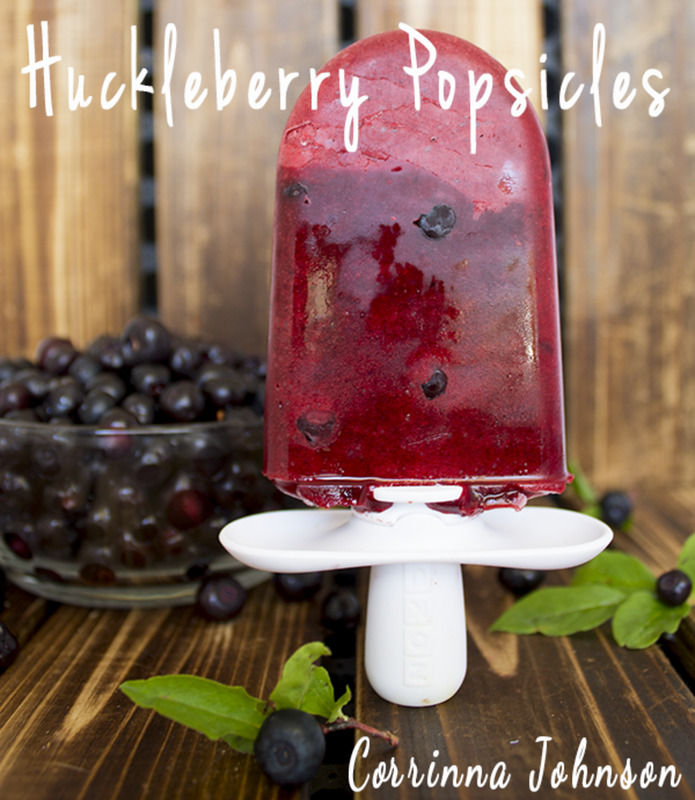 This is a summertime favorite recipe that I have masters for my family. It is called a Strawberry Cream Freeze in Waffle Cones. Oh thanks so much and hope you try to make this and enjoy!! What a fun idea!! Great recipe!! Thanks :) voting up! Thank you Sasha. Coming from the queen of yummy desserts I am humbled and truly appreciate your compliment too. Also thanks for the votes, share and pin too!! What a great treat anytime of year. Iguidenetwork, thank you for stopping by and your lovely comment too!! Millionaire Tips, thank you so much for your comment and hope you get to try to make these. Also appreciate the votes too!! What a great idea! We like s'mores anyway, and this is a super way to make them even better. Voted up! John Sarkis, thank you for saying that, it is so very appreciated!! This looks delish...should win HODT in my personal opinion. 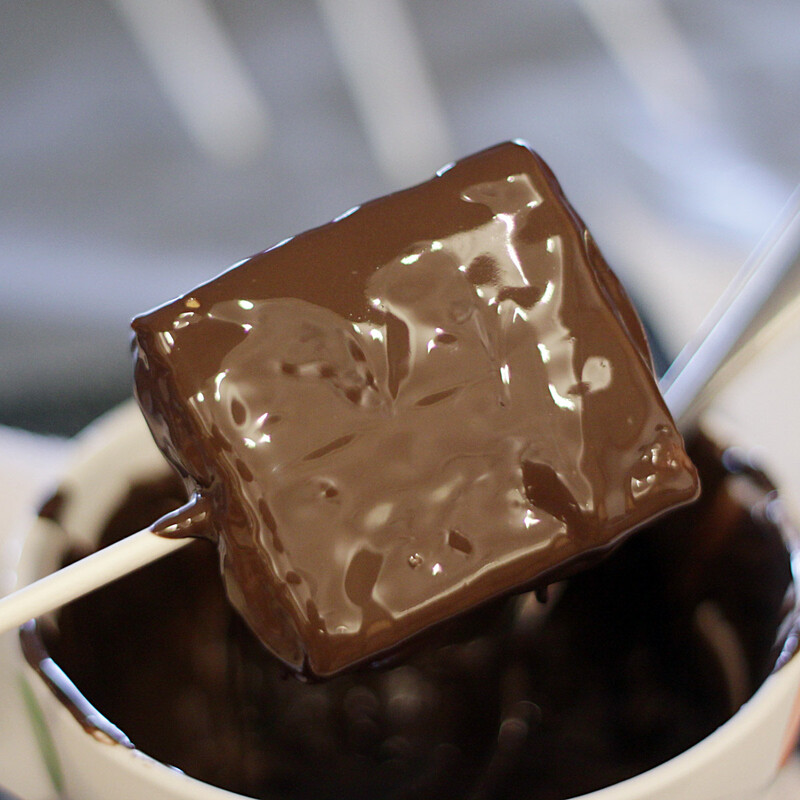 I love chocolate and marshmallows together. Still love this idea. I showed this to hubby and he demanded to know why I hadn't made them yet. LOL! Sen.sush23, Thank you also for your kind words here and also hope you get to make these and enjoy!! Thanks also for voting up and sharing too!! Nmdonders, thank you so much for your kind comments here and also hope you too get to try and make this one. Enjoy!! Ishwaryaa22, thank you very much for stopping by and for you ever so kind comments on my recipe and on my family too. Also can understand that you too never heard of smores, but love that you can look them up on Wikipedia. Seriously that site has everything and is so invaluable. Thank you also for sharing and pinning too. Rajan Jolly, thank you so much for lovely comment here and do understand that you never heard of smores before, but do hope you get to try and make some too!! This is innovation! It sounds and looks sooo....soothing! I wish I was somewhere close to your house and could rush in for one ..right now. But since that is not happening, I must try it out- to please myself. Voted up and sharing. That is such a good idea and looks really good. I am definitely trying this one. The sprinkles make it look so yummy. Thanks for sharing! An easy & tasty dessert recipe with clear directions & drool-worthy photos! Like rajan jolly Sir, I have not heard of s'mores till now thanks to you. I also checked out this term on Wikipedia. Your memories of your early days with your Prince Charming and your kids added a wonderful personal touch to this engaging hub of yours! Well-done! Janine, what a simple yet awesome recipe. I've never heard of smores but reading and watching the pics makes me want to make some. voted up and beautiful. Sharing this too. Bookmarked. Keith, from one sweets eater to another, I hope you do make this and totally enjoy. Thank you seriously for the comment, votes and for sharing too!! You make interesting desserts, Janine! Thanks for this recipe, which I'm sharing! MMSU, sorry for posting this with pictures that made you want to take a bit from the screen lol!! But seriously thank you for your comment, votes and share too, very much appreciated!! Please don't his to us=D The pictures made me feel as if i wished i could just have a bite from the screen.Anything involving chocolate is just too good to resist.Great stuff,ill try this one in a jiffy=D.Thanks for shring this with us.Voted up and shared! FullofLoveSites, thank you so much and do hope you can make and try to to satisfy your sweet tooth!! oh my, my sweet tooth is aching up for this treat! I'm definitely going to try this one. great hub! Ivona, thank you and do hope you can try and enjoy this one!!! Barbergirl, I know what you mean about a sweet tooth, because I too have one and this one definitely does seem to help satisfy it. Thank you seriously for your comment and compliment on my recipe. The chocolate on the outside indeed makes this one a bit less messy than its original counterpart for the kids and I am all for that as a mom of 2 small kids!! Thank you for pinning and hope you do get to try soon. Also thank you for sharing too!! Oh, wow! What a fun idea. I love s'mores, and first learned about them as an adult, when my kids were in Girl Scouts. Bookmarking this hub...shared, voted up, useful, interesting, awesome and starred! I have been trying to get my sweet tooth under control and after reading this I want to run out to the store and get all the stuff to make these and eat them until I have to be rolled. This look absolutely brilliant and honestly, what a genius idea. I bet having the chocolate on the outside makes these little treats a whole lot less of a mess for the younger kids. I have a couple of BBQ's to go to this weekend and I bet these would be the perfect treat to bring. Thank you for that suggestion. Seriously may do just that and from one stay at home mom to another, I truly do appreciate this more than you can even imagine. Thank you!! Terrye, I can see that too now that you mention it and may need to try to make some as a gift for Emma's pre-school teacher. Thanks for the idea :). Seriously thank you!! Thanks for the stopping by and commenting too Jusbeth16! Thanks Terrye. Seriously with 2 small kids I am constantly trying to find meals that are a bit less messy, but still quite tasty too and thankfully this one fits the bill!! Unknown spy, thank you for your kind words here and hope you too get to try this one out and enjoy!! GoForTheJuggler, thank you for comment here and appreciate your stopping by. If you make them, I hope you too enjoy!! George, thank you so much for stopping by and for your comment. Hope you get to try and enjoy this smores variation recipe too!! Wow! A mouth-watering summer treat! YUUUMMY!!! This is fantastic - I'm definitely going to remember this! Oh my! We love smores here and I am going to have to try this! Thanks for sharing! Deborah, thank you for the comment and for also sharing o. The cooking page on Facebook. I hope your grand kids enjoy it when you do get to try. this looks so good. I cant wait to try it with my grandchildren. 4wardthinker, these don't melt as quickly as s'mores without being coated in chocolate, but when you bite into them the chocolate inside is still soft. I hope that makes some sense. That said thank you for your comment, it is truly appreciated. Yum! Do they melted and gooey after they are covered with chocolate? That's my favorite part after the charred coating. Donnah75, I never even thought for a concessions stand fundraiser, but could see your point on this and lie your idea. Thank you so much for stopping by, commenting, voting and sharing too. It is very much appreciated. This is awesome. I can see this being a big hit at a concession stand fundraiser. Voted up and sharing. Oh thank you Tracy. Hope you enjoy and definitely let me know when you do try!! Thank you so much for the share Mary. It is very much appreciated!! Julie, you definitely have a good outlook here on your diet and know you will keep to your resolve. Thanks again fro all your support though, totally appreciated!! Linda, thank you as always for stopping by and agree with your word completely, yummilicious...love that word!!! Don't be sorry - the fact I am still looking at it tells you something about my resolve :o( I am a foodie, pure and simple but I am trying to be good! Sorry to have posted this while you are dieting Julie. I totally understand and hope that when you are able to in September, you will make and enjoy then. Thanks for your comment and support!! Mary, I am the biggest offender of eating these as quickly as I make them, because chocolate is truly my downfall. That said, thank you so much for the kind comments and for sharing on Hubville for me!! I would imagine these get eaten as fast as they get made! They look delicious and I have a feeling there'll be some chocolate covered s'mores spreading around hubville! Thank you so much breakfastpop. I do love the stick too, because it really does help with the mess a bit. Smores are the best. I love the idea of a stick! Dexter, thank you so much for stopping by and commenting. It is totally appreciated!! 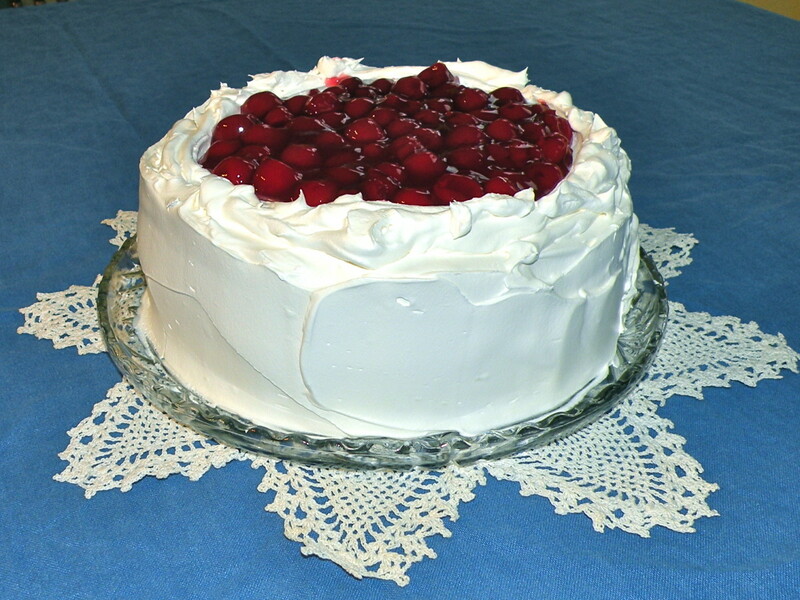 Thanks for sharing this terrific recipe! Love it! Shiningirisheyes, th asks for volunteering to take one for the team and try these. Seriously, can' t thank you enough for your comments here and for your continued support! We eat many smores as they bring back wonderful childhood memories. I have yet to know someone who does not enjoy one. You come up with awesome and unique ideas. I am looking forward to trying these. Its a tough job but someone has to do it. I guess I'll volunteer. Redberry Sky, thank you so much for stopping by and commenting. 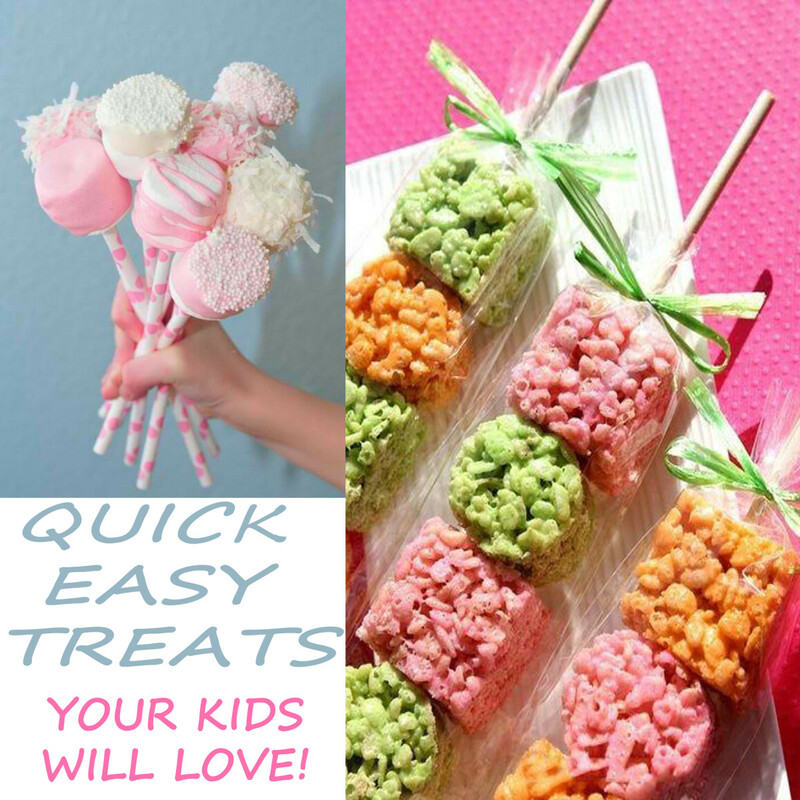 I love marshmallows and can eat them by the handfuls! But seriously I hope you do get to try this one and enjoy!! Rui, even though this may be too sweet for you (I do totally understand), thank you so much for your kind words here. It is totally appreciated. Dghbrh, thank you so much for stopping by, commenting andy voting up too. It is very much appreciated. Ronna, thank you for stopping by and for your comment!! Joseph, what can I say, but thank you so much. I am going to have to take a look at your new poem now this morning and very excited about that. I totally appreciate all your kind words here about recipe and me too. I just love me kids with all my heart and never think twice about that one. Thank you so much yet again for everything from the bottom of my heart!! Dianna, thank you so much for stopping by and for your lovely comment. I agree about chocolate, believe me if I could live on just chocolate I would! But seriously I never tired of this recipe and chocolate I can't say enough about that one little, but grand ingredient! Too sweet for me, but the hub looks great and I can see a lot of work was put into this! delicious looking and easy idea. This was a marvelous idea, on a hub. I was a kid...well I'm still a kid. You have made it so easy for us. Love chocolate and love smores! Thank you from the bottom of our hearts for being such a wonderful mom. My last piece of poetry is dedicated to moms like you! Thanks! I can't say enough about this recipe idea -- chocolate! You can't go wrong with any s'mores desserts on a trip, in the home, for a party, etc. Yum! Bill, I loved this comment and got such a good chuckle here. If I could I would make these tonight and send them to you, u fortunately my 2 kids have me still on my toes from earlier today. They et up from their naps and just never stopped. But seriously, your comment was by far the best so far on this one and could totally tell you liked my recipe!! Thanks again as usual for all your continued support. Vocalcoach, I agree about the more chocolate the better. Believe me I love chocolate so I don't think I can ever get enough and this recipe surely satisfies that chocolate craving. Thanks again and much appreciated. Sign me up! In fact, if you could put a few dozen of these in a box and send them to me, that would be great! I promise I'll write a review on them after I have personally shoved all of them down my throat! The more chocolate, the better! Ooooo this looks so good. The first time I had smores was on a camping trip with my older son and the grandkids. They were so delicious. I like your recipe and very clever with a stick. Voted up and thank you! Thanks kygirl89 for stopping by and commenting. Between the harder chocolate outside shell and the stick to hold, it does seem to make the mess a bit less. I love s'mores!! This is an interesting twist. Maybe it will help make them less messy. Thanks for sharing! Matthew Kirk, thank you for stopping by and your kind comments. Josh, thank you so much for stopping by and you can totally try double chocolate here if you want. I usually always have vanilla and chocolate chips I. The house now for baking and never even thought of that, but I guess that is the beauty of this recipe it can totally be amended for that. Awesome recipe! :) I love sweets too! So, why not double chocolate? The more, the merrier! Lol. And cook/preparation time is perfect for me! Under five minutes, lol. Thanks for sharing!